The IEH Listeria spp. Test System (IEH Listeria Test) is designed for use by laboratory technicians with proper aseptic techniques needed to perform DNA amplification-based assays in a biosafety level 2 laboratory environment. The IEH Listeria Test allows rapid detection of Listeria sp. in foods such as raw meats, RTE products, leafy greens and environmental samples. Presumptive identification is completed within 24 hours. It is recommended that test samples for which presumptive positive results are obtained be confirmed by subsequent application of confirmation procedures described in BAM (http://www.cfsan.fda.gov/~ebam/bam-10.html) or FSIS MLG http://www.fsis.usda.gov/PDF/MLG_8_05.pdf). 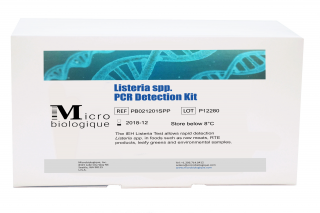 The IEH Listeria Test simultaneously detects the presence (or absence) of Listeria spp. Specific fragments of the bacterial DNA, which are unique to the target organisms and not present in other bacteria, are amplified using DNA polymerase.